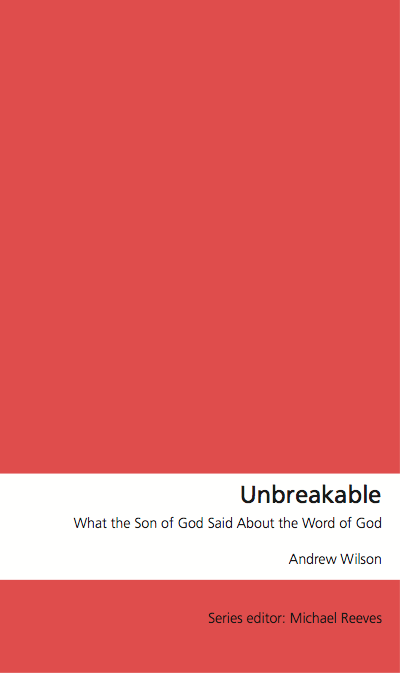 A little while ago, Andrew Wilson sat down with a famous British church leader and had a series of discussions about what the Bible says and what it doesn't, what it means and what it doesn't. I think he got a bit frustrated by that, so he wrote this book. He wrote this book so that you'd read the other Book, and not read it like any other book. His main point here is that the place to start when considering the Bible is Jesus: what did He say and believe about it? As Christians are meant to be followers of Jesus this has a powerful logic that's easily lost on us. So he looks at what Jesus said about where (or rather, Who) the Bible came from, its authority, its coherence, its clarity, and its purposes. Because this is a very short book, many of its arguments are summaries and starting points for further thinking and talking. (There is a list of longer books to consider at the end too, and the blog he contributes to often discusses this kind of thing.) Don't expect every question to be answered exhaustively, but you will be pointed in the right direction. As often with Andrew, you may feel like you're being moved at breakneck pace through a museum exhibition or court case, with him turning round every so often to say, "So, do you see?" He's writing mostly for Christians, and I'd suggest if you're not a Christian but you want to think about whether the Bible could be true, you'd do well to start with Andrew's own If God Then What? or Timothy Keller's The Reason for God, both of which think carefully about this. If you're a Christian with concerns about the Bible, I think you should read this book. You'll be encouraged by its clarity and coherence, and probably also by the fact that you can read it very quickly. And then you might be able to try the rather longer book it points to with a bit more confidence than before.